Sign up to the Megan Nielsen Patterns Newsletter and get access to our FREE newsletter subscriber patterns! Hello Design Diary readers! When Megan released her Harper short pattern, I fell in love with the higher waist and patch pockets. 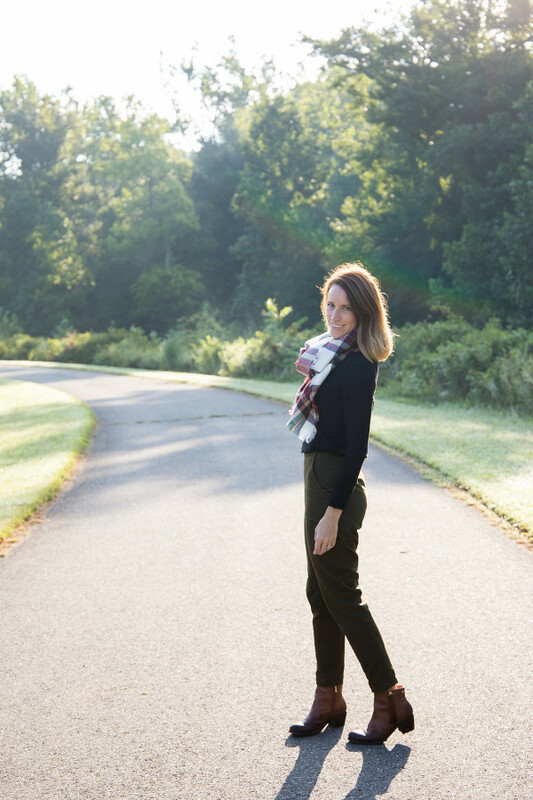 I recently moved from southern California to northern Virginia, however, and I am now in desperate need of fall/winter clothes since I haven’t really needed any the past 8 years. 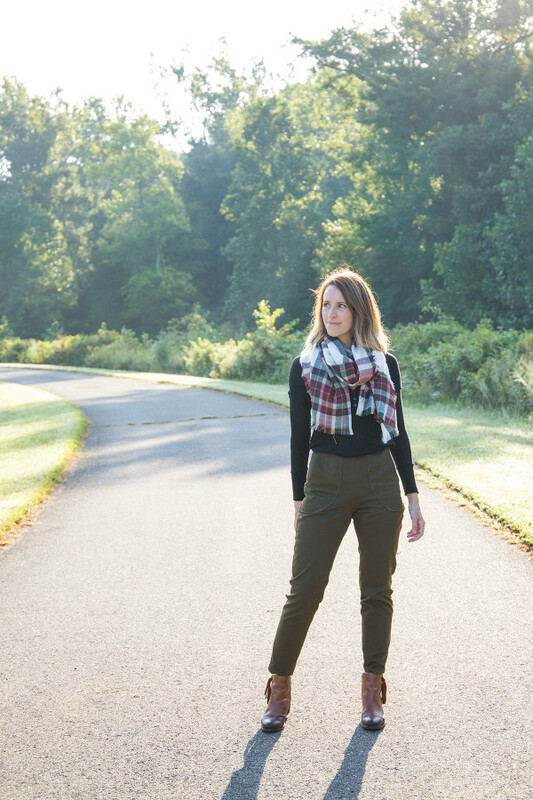 I decided lengthening the Harper shorts would be a fun challenge and I’m here to share with you the approach I took to create this more fitted tapered crop pant. Of course, you can follow these steps to create a wider leg pant if you so choose. I’m not sure if this is the “proper” way to lengthen a shorts pattern, but it worked and I’m happy with the results. 2 Yards lining if using 60″, 3 yards if using 45″ wide fabric. For my pants I used a Marc Jacobs Military Olive Twill from Mood Fabrics and a Rag & Bone Tan Viscose Twill also from Mood Fabrics for the lining. 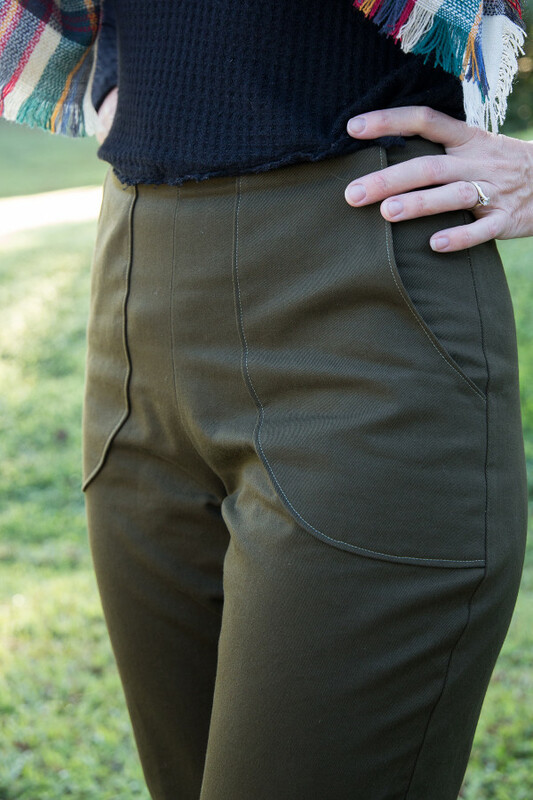 I will say, I absolutely LOVE the look of the olive twill, but it has absolutely no give to it, not even on the bias, so although I can sit perfectly fine in my pants, I can’t easily squat in them. If I were to make these again, I would probably use a woven that has a little bit of stretch to it. Step 1: First cut out all pattern pieces for Version 1 (the shorts) in your appropriate size. Step 2: We will start with the front short pattern (1). Grab a large sheet of paper, about 20″ x 30″. Draw a horizontal line at the top of the short side of the paper. Tape your cut Harper pattern piece #1 above the horizontal line, matching the bottom of the pattern to the line. On the front piece, the grainline should be perpendicular to the hemline. Step 3: Extend the grainline from the shorts pattern down your paper. 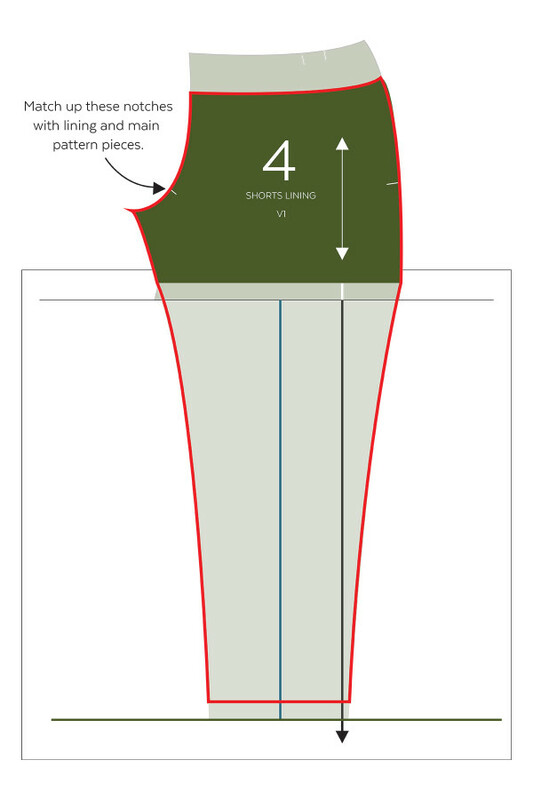 Step 4: Measure the bottom edge of the shorts pattern to find the center point on the edge. From this point, draw a vertical line that is parallel to the grainline. In this case, this line will also be perpendicular to the shorts patterns bottom edge. Step 5: Decide on your desired inseam for your pants. The Harper shorts pattern have a 3″ inseam. I chose a 28″ inseam, so I needed to add 25″ to my shorts. Using your center line (blue) as a guide, draw a horizontal perpendicular line to your new bottom edge of your pattern (green line). Remember, the hem allowance was already included in the shorts pattern. *Since the inseam is really measured on that inside curved line, you will be gaining about a 1/2″ by measuring along the straight blue line. If you want to be more precise, go ahead and move that green line up 1/2″. Step 6: We will now be creating the ankle width (leg opening) of the pattern. Decide on the circumference of the leg opening you would like your pants hem to have. I chose an 11 1/2″ leg opening, which is about a 2″ ease from the spot on my leg the hem will hit. I don’t recommend going any smaller than a 2″ ease, as anything smaller might not fit over your foot and would probably be uncomfortably tight, unless your fabric has some stretch. If you look at any pants patterns or your ready to wear pants, you will see the front pattern piece is more narrow than the back pattern piece. For these pants, I used 46% of the total circumference in the front and 54% in the back. 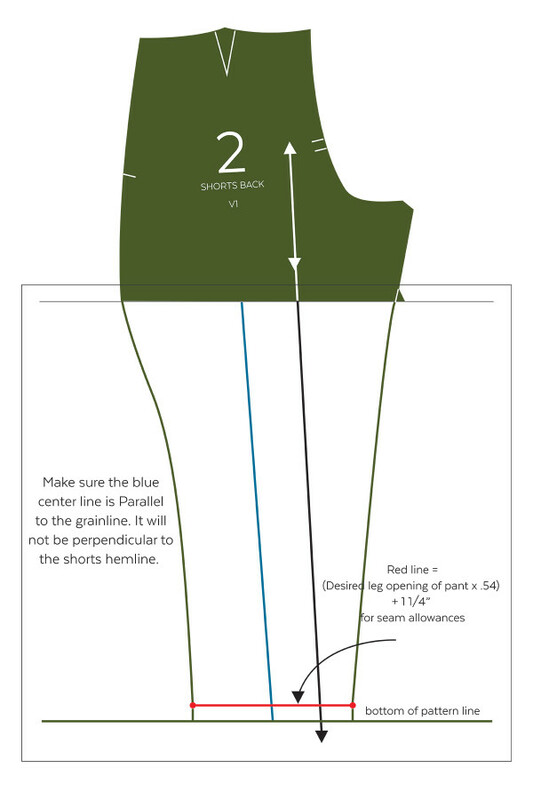 To create the hemline on your pants, first measure up 1″ from the bottom green line and draw a parallel horizontal line. This will be the hemline on your finished pants. The 1″ will be your seam allowance. To create the red line, multiply .46 x your desired leg opening. Add 1 1/4″ to this number for the seam allowances. Center this red line to your blue center line. Step 7: Now we get to add the curved lines connecting the shorts pattern to the ankle line. 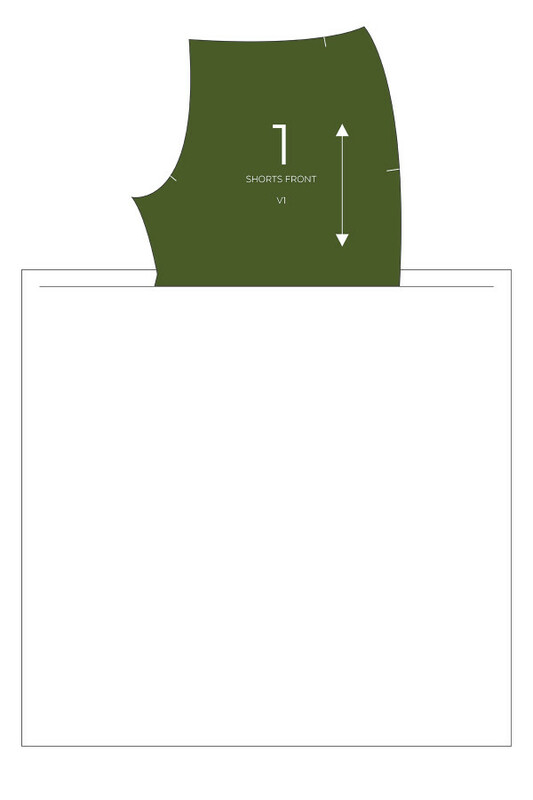 The shorts pattern has a bit of a flare at the end for the hem, make sure to cut that part of the pattern off. My best advice here is to do a straight line with a ruler and then add the curves as you see fit. If you are doing a wider leg pant, you probably will not need too many adjustments. If you are doing a more fitted pant, you will probably want to do a muslin to make sure you get the curves right. You can also use a pair of pants you like the fit from as a guide. I did a muslin and needed to trim off about 1/4″-1/2″ around the upper thigh on each line. Step 8: Go ahead and add vertical lines connecting the ankle line to the bottom edge of the pattern for the hem allowance. The back shorts hem is not perpendicular to the grainline. When drawing the blue center line, have it be parallel to the grainline, not necessarily perpendicular to the shorts hemline. Also, remember the back pattern will be wider. To create the ankle measurement (red line), you will be multiplying your desired leg opening by .54, instead of .46. Step 10: You will also need to create new lining pieces to make pants. Because, there is a facing at the waist, the lining pieces do not have as high a rise as the main pieces. If you match up the notches of the shorts pattern pieces and the lining pieces, you can simply trace new lining pieces. The red outline in the image above will be your new front lining piece. Just make sure to move that hemline up at least 1″ on your lining pieces. Step 11: Repeat step 10 with the back pattern piece to create your back lining. It will be a bit trickier due to the slight changes since the main pattern has a dart and the lining just has a small pleat. Just make sure to match up the outer notches and match up the slopes of the inseams. Step 11: Sew up your pants following the directions for the Harper shorts pattern. When sewing the inseam of the lining, you will need to pull the lining through the pants leg and do one pant leg at a time. It’s the same process as the shorts, but may not seem as obvious with the long pant leg in the way. And, you are done! Enjoy your nice new pants! Thanks for following along with my tutorial! I hope you found it informative and helpful. Come say hi on my personal blog Lace & Pine Designs. I love meeting new people in the sewing community! Amazing! Such a professional easy to rrad diagrams and instructions! I hadn’t bought this pattern yet but i think i definitely need it now! Aaand…pinned! Thanks for sharing, what amazing pants! Get access to our FREE subscriber perk sewing patterns, exclusive monthly discounts and be the first to hear about new patterns! All photos and contents on this site are copyrighted by the author, Megan Nielsen, unless otherwise noted. All tutorials and patterns are copyrighted by Megan Nielsen. 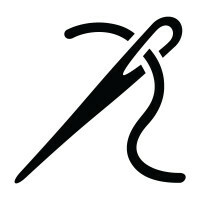 Get access to our library of FREE sewing patterns, exclusive monthly discounts and be the first to hear about new patterns!